Don’t we owe it to ourselves to give our dreams a fair shot? 15 Dec Filed under Uncategorized. Bookmark the permalink. “I think you’ll be the world’s best garbage man,” he said. He asked me pointed questions to genuinely understand the root of my interest, which stemmed from my grandfather who worked as a Chicago garbage man before I was born. I loved my grandfather, I loved the stories my dad told me about him, and he inspired my dream. While my path surely meandered in other directions as I grew, the shifts came from within. Looking back at that moment, my parents armed me with the courage to explore my curiosity, gave me permission to allow my dreams to evolve, and allowed my inner voice to orient me towards my true north. As I grew older I realized that my experience was not the norm. A neighbor of mine frequently narrated the future he planned out for his daughter, Alex – my friend. He would say, “we are enrolling Alex in the best primary schools, to get her into the best prep school, to get her into the Ivy’s, so that she can attend Harvard Medical School and become a top cardiologist. He beamed with pride. But when you asked Alex what she really dreamed about, her eyes would light up with excitement as she talked about living in New York City and working for a fashion magazine. To her parents, this idea was heresy. To Alex, however, fashion was a worthy dream, valid, important, and perfect, even though she was still developing the rough draft of her idea. This gap in vision between a well-meaning parent, and an exploratory child can be likened to the difference between magnetic north and true north. During my orienteering merit badge in scouting, I was fascinated to learn that the magnetic poles of the earth do not coincide with the geographic poles of the planet. At certain locations, they might differ by as much as 20 degrees. What magnetic influence are we having on the compass of the people around us? Will my friend Alex ever be able to discover her true north when the magnetic pull of her dad’s influence is so great? How strong are the magnetic influences of power, prestige, and wealth? Like carbon monoxide, the colorless, odorless, gas that can suffocate people in the night, how strong do the magnetic fields of expectations have to be to suffocate our dreams? What about school and college? We are asked to choose a major, a minor, a secondary, a concentration, to write a thesis, study Ethical Reasoning, explore the Societies of the World, and study Culture and Belief. We’re encouraged us to do public service, to become a leader, to shine, to give back and to donate. We are challenged to analyze, memorize, theorize and speak. But wait. In that magnetic sea of expectations, what is keeping our own dreams afloat? Which way is north? Which way is true north? Dreams abandoned leave a void to be filled by somebody else’s plan. To rediscover our dreams we must stand for something. We must share our dreams, even though it makes us vulnerable. We must construct a vision for the future, so that we can truly become the change that we want to see in the world. Every new job, new invention, new movement, starts out with an idea, with a vision. Don’t we owe it to ourselves to give our ideas a fair shot? For if we are challenged to dream, they just might come true, and evolve into something we never imagined. 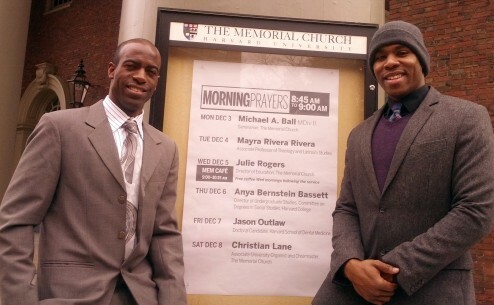 Jason Outlaw (left) delivered this speech on Friday, December 07, 2012. Sheehan Scarborough (right) delivered the benediction. 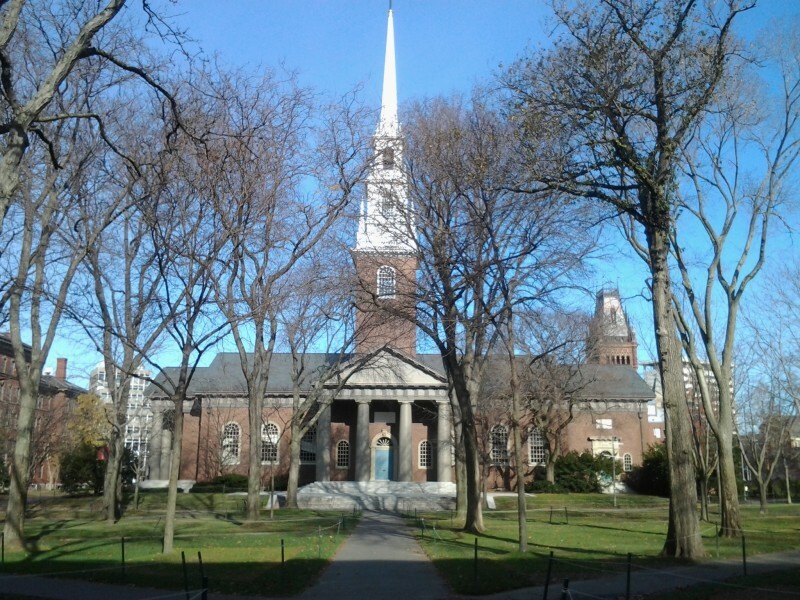 Morning prayer happens daily at 8:45am at Memorial Church on Harvard Yard in Cambridge, MA. ← Older: The Student Handbook, Revised.